If you are looking for hotels at a great destination in Thailand have a look at Pattaya. The coastal resort of Pattaya is one of Thailand's most popular destinations. A lively and vibrant resort, Pattaya is perfect for a more active holiday experience and, by day or night, you can guarantee entertainment. Pattaya is a haven for sightseeing and nightlife, water sports enthusiasts and sun lovers. Beautiful beaches, fantastic dining and a wide selection of luxury hotels and resorts await. 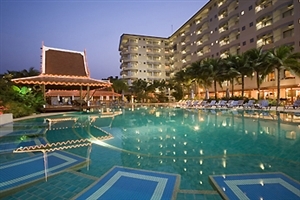 We have a wide selection of hotels in Pattaya from great value 3 star accommodation to 5 star luxury Pattaya hotels. 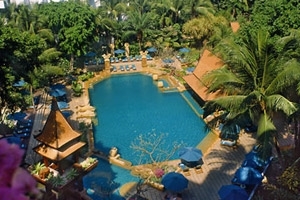 If you are looking for an excellent budget hotel in Pattaya check out the Sunshine Garden or the Loma Resort & Spa. 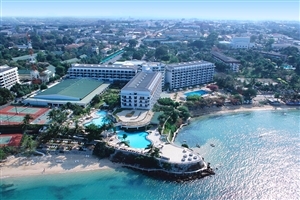 For a touch of luxury check out the Centara Grand Mirage Beach Resort or the Sheraton Pattaya Resort. If you are looking for more than just a hotel have a look at our holidays to Pattaya and if you are looking to visit other destinations as well have a look at our Pattaya multi centre holidays. 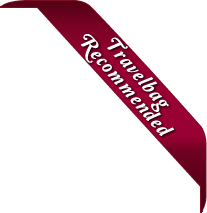 Enjoy fantastic savings when booking your Pattaya hotel with Travelbag.co.uk. Our close relationship with suppliers means we can offer the lowest rates on hotels in Pattaya. With over 30 years experience in booking Pattaya hotels and holidays in Thailand our expert team has gathered extensive knowledge on the best flights, hotels, tours and activities to make your 2017 Pattaya holiday an unforgettable experience. Here is just a selection of our favourite and cheapest hotels in Pattaya. Please use our search panel above to find your perfect choice. Discover why Sunshine Garden Resort has become a firm favourite amongst guests over the years with a stay in one of Pattaya’s premier hotel resorts. 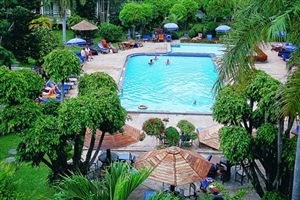 Situated in the north of Pattaya, Sunshine Garden Resort is ideally positioned for guests to take advantage of the popular shopping and nightlife areas, while ... the famed beach and many tourist attractions are also within easy reach. Experience exceptional hospitality at Sunshine Garden Resort, where the friendly staff will greet you with a smile and our well-appointed guestrooms with charm you with its sophisticated décor. Designed with the influence of traditional Thai themes and architecture, The Green Park Resort is the ideal tropical hideaway for guests planning a dream Pattaya holiday. 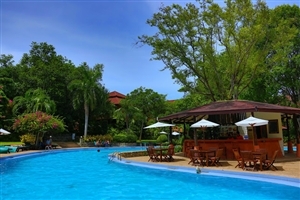 Located on the quiet northern coast of Pattaya, The Green Park Resort is tucked into lush gardens and bold scenery, creating an exceptional setting ... for a calm and tranquil tropical retreat. Boasting impressive on-site facilities, from the distinguishing freeform swimming pool that meanders around the resort, to the two excellent restaurants, The Green Park Resort has something for everyone to enjoy. Located in the centre of Pattaya, close to many of the city’s premier shopping and entertainment attractions, Mercure Hotel Pattaya is also just a short stroll to the nearest beach. 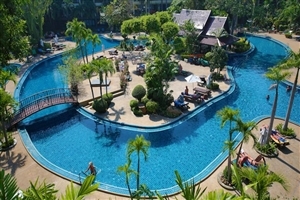 A high quality, excellent value Pattaya holiday resort, Mercure Hotel Pattaya offers spacious and practical accommodation for the whole family ... to enjoy, while the impressive array of facilities include a swimming pool, a fitness centre and Wi-Fi Internet access. Guests can also choose between three restaurants, bars and bistros during their time at Mercure Hotel Pattaya. 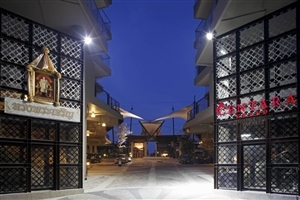 Ideally located in the centre of the vibrant and exciting city of Pattaya, Centara Pattaya Resort is a recently-built, modern hotel ideally located for all the attractions to be found in the surrounding area. Stylish and contemporary in its design, Centara Pattaya Resort is something of a calm oasis in ... the heart of one of Thailand's popular tourist destination. With impressive facilities and 152 well-appointed, comfortable and practical guestrooms, Centara Pattaya Resort is ideal for those seeking premier accommodation at excellent value prices. A modern haven designed with fun concepts and a modern outlook in mind, the Centra by Centara Maris Resort Jomtien serves as a family-friendly getaway that brings together the beauty and splendour of Thailand’s resort town of Pattaya and the comforts and conveniences each and every guest needs for an ... unforgettable holiday experience. Boasting a number of in-house dining venues, a wide array of soothing and recreational facilities and a whole host of stylish accommodations to choose from, guests can expect nothing less than excellence when staying at this cheerful resort, and with something to appeal to visitors of all ages, this is the perfect setting when considering a visit to Pattaya no matter who you are. Relax and unwind at Woodlands Hotel & Resort, a beautiful four-star Pattaya resort that delights with its elegance and sophistication. Tucked into its own tropical gardens and looking out over the stunning Gulf of Siam, Woodlands Hotel & Resort boasts refined design that has been inspired by charming Thai architecture ... and themes. 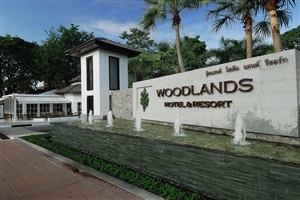 Featuring a prime location in North Pattaya, Woodlands Hotel & Resort is ideally positioned for guests to enjoy the shopping and entertainment district of Beach Road. Enjoy pure luxury at the 5* Centara Grand Phratamnak Pattaya, located at the southern end of Pattaya, the hotel is walking distance to the beautiful sand beach. Delight in stylish modern decor with marine themes and Italian furnishings. 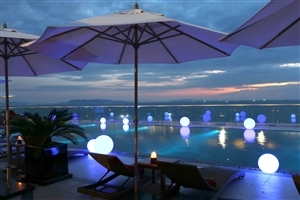 Unwind in the rooftop pool or Jacuzzi after exploring Pattaya. Guest rooms ... are lavishly appointed including a large balcony or terrace with family rooms and suites also available. Savour delicious cuisines with a choice of five restaurants and bars including the signature Ruffino Restaurant & Lounge located on the rooftop with panoramic views across the bay. 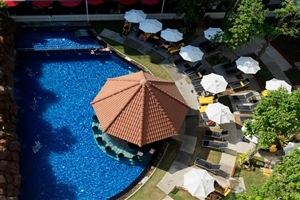 Centara Grand Phratamnak Pattaya is the ideal locations for couples, families or groups. Stretching into the Bay of Bangkok from its position on the quiet north end of Pattaya Bay, Dusit Thani Pattaya is a magnificent Pattaya holiday resort. Surrounded by an area of splendid natural beauty, Dusit Thani Pattaya has become a firm favourite amongst leisure and corporate travellers. Savour the impressive ... views from one of 462 comfortable guestrooms and enjoy easy access to one of Thailand’s most famed and beautiful beaches, where you will appreciate the peace and serenity of the resort’s excellent location. 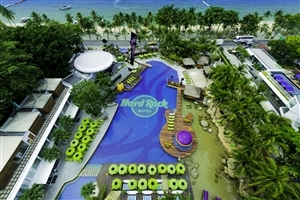 Get ready to experience Pattaya like never before with the Hard Rock Hotel Pattaya, the most stylish, vibrant and fun getaway to grace Beach Road. With a design infused with energy and homage to all things music, the aesthetic and sounds of this Thailand getaway are a real treat for ... the senses. Featuring 323 modern accommodations to choose from, a number of in-house dining venues, a gorgeous pool and spa services to utilise, it’s hard to resist the lull of the Hard Rock no matter who you are. Whether you’re on a family adventure, a romantic getaway or a business outing, be sure to get the most out of your time in Pattaya with the Hard Rock Hotel. AVANI Pattaya Resort & Spa is a glistening pearl sat in the city centre of Pattaya among the glorious tropics of lush foliage, overlooking the spectacular beach. Despite the central location, the resort is designed with total privacy in mind, far from the hustle and bustle of the city. The ... design of the resort lends itself to traditional Thai inspired decor, with the warm wooden textures creating a simplistic yet elegant contrast against the emerald greens of the trees which sway nearby, offering shaded reprieve from the glorious sunshine. Set on the quiet sands of Wong Amat Beach, Centara Grand Modus Resort & Spa is a new Pattaya holiday resort to appeal to both couples and families. Blending ‘industrial chic’ with vintage flourishes, Centara Grand Modus Resort & Spa is a stylish holiday resort with its contemporary guestrooms, suites ... and residences, attractive bars and appealingly unique touches. Form and function work in perfect harmony, with a variety of facilities to be enjoyed, including the indulgent Spa Cenvaree and three swimming pools, while guests can also dine in style in one of five restaurants and bars. 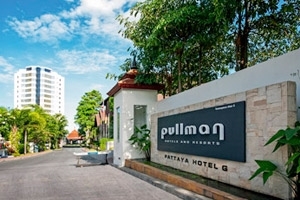 A contemporary resort showcasing an enticing blend of traditional Thai hospitality and modern amenities, the Pullman Pattaya Hotel G is the ideal choice for a Pattaya holiday. 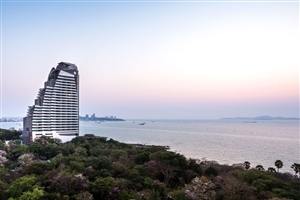 Overlooking the Gulf of Siam, the beachfront Pullman Pattaya Hotel G offers 353 guestrooms and suites, while facilities include a swimming pool, the ... Aisawan Spa and a fitness centre. Perfect for families and couples alike, Pullman Pattaya Hotel G also features an array of dining options, plus direct access to a private stretch of Wong Amat Beach. Treat yourself to contemporary design, modern accommodation and excellent facilities with a stay at the five-star Cape Dara Resort in Pattaya. Located on the revered northern coast of Pattaya, Cape Dara Pattaya offers 264 smartly-styled, well-appointed guestrooms and suites, each of which has been designed to offer expansive views to ... savour. Facilities at Cape Dara Pattaya include two swimming pools, a luxurious spa and a fitness room, while the Kids’ Club makes the resort an excellent choice for Pattaya family holidays. Standing tall as a distinctive new fixture of the Pattaya coastline, the Centara Grand Mirage Beach Resort is a stunning five-star holiday destination. 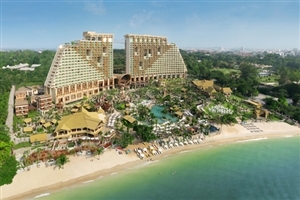 Located on the beachfront, along 230 metres of pristine sand at Wong Amat Beach, Centara Grand Mirage Beach Resort’s twin towers rise into the skyline, overlooking a ... vast area of tropical gardens and containing 554 elegantly-appointed guestrooms and suites. Centara Grand Mirage Beach Resort blends style with function, offering a host of superb facilities, including a large tropical swimming pool, sporting activities, six restaurants and bars and even its very own Monsoon Water Park, a fun-filled water activity venue filled with water guns, water umbrellas and more. A bold fixture of the Pattaya coastline, Amari Pattaya Resort is an expansive hotel that offers quality service in a beautiful location. Flanked by lush tropical gardens and overlooking calm blue waters, Amari Orchid Resort is made up of two wings – the Garden Wing and the Ocean Wing – ... and presents a fantastic range of facilities and amenities, as well as plush accommodation. 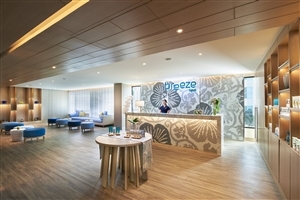 Located on the beach, guests have the opportunity to stay within the glorious confines of the resort, or venture onto the golden sands of Pattaya Bay. Located just a short walk to Wong Amat beach, considered one of the cleanest and most secluded beaches in the beautiful coastal city of Pattaya, Loma Resort & Spa offers guests the chance to experience the best of both worlds. Boasting fresh design and contemporary décor, Loma Resort & Spa ... is distinguished by the free-form swimming pool that ripples through the resort, creating a relaxing ambience for guests to savour. Should you wish to venture further, Loma Resort & Spa is just 500 metres from Wong Amat beach, while the shopping and entertainment areas of Pattaya are also within close proximity.